Manufactured in ex-URSS from Circa 1980 until after 1980. Too bad the nickname of "brick" is already taken by the Argus C3 because it would suit it perfectly. 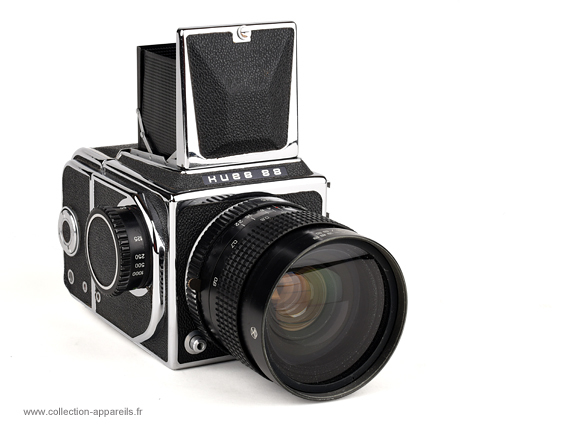 It is a single lens reflex format 6 x 6 cm. The construction is very modular. We find , mounted on the camera body, the removable back (the camera being delivered with two backs) that can be removed during the roll, the viewfinder and of course the lens. Once these three elements removed, the box is very small. It does include the shutter and the cocking mechanism. Pinions are coming to couple with those of the back to ensure the advance of the film. It is on the film winding that appears the biggest downside of these devices: the spacing between frames can be very irregular. Last trap to avoid: As in many Soviet camera, please never change the shutter speed without prior cocking.